Extracts from the Visitor’s books here at Endmoor Farm Holiday Cottages reveal that Peak District Holiday Makers simply love Endmoor Farm Holiday Cottages. Fab location and good quality accommodation. Nice walks & pub all from the house which was lovely and warm on our return. Lovely warm welcoming house on a cold weekend. All is cosy inside as we survey the wintry landscape. Gorgeous cottage, welcomingly warm and cosy when the ‘tundra’ came! Thanks Tom and Sue for your amazing generosity during our extended stay! Endmoor House was a lovely second home to come back to after many great walks! Thank You. 12.04.13. Stockdale and Wright Family get together. Thank you, great location and superb facilities. Perfect set -up for family get together. 26.03.13.Paul and Astrid sadler – Basildon Essex. ‘The worst snowfall in 20 years’ A515 closed by drifting snow…our holiday was forcibly extended by 2 days. After 4 days of being snowbound we finally had to leave this beautiful landscape. Tom and Sue couldn’t have been more accommodating. Very, very nice people…getting supplies and making sure we were alright. they took care of us marvellously. Can’t wait to come back again. A fantastic cottage with exactly what we were looking for. Wonderful scenery… the snow making it even more picturesque Thank you we will be back. Lovely cottage, super location, great host. Shame we couldn’t stay longer. Definitely be back. It was awesome and we had great fun here. The dogs liked it too. At Endmoor Farm there is a warm welcome for your pets too! 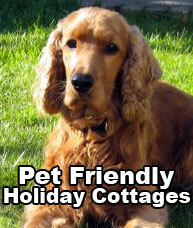 We offer superb four star pet friendly accommodation. So if you are looking for dog friendly cottages in the peak District Look no further. Enquire today.